Whether you are coming for Garden Clean-Up or not, come and see what is in bloom—history and flowers alike— at the Seward House gardens with Education and Outreach Coordinator Zach Finn. Zach will lead a newly-designed walking tour through the historic Seward family grounds, describing Mr. Seward’s vision of “wild nature” for his sprawling acres and the menagerie of animals which called it their home. 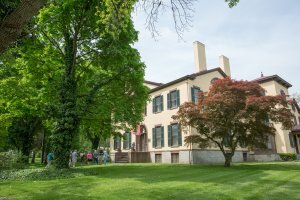 "Beyond the Garden Gate" will be held in the grounds of the Seward House Museum. This event is free and open to the public.